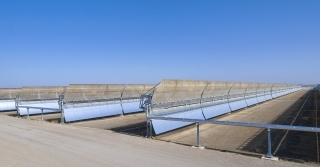 More than 530,000 of annealed RP3 mirrors have been supplied by FLABEG FE for the parabolic trough plant in Ouarzazate, Morocco. In a written statement, the company highlighted “its unique bending and coating technologies” that “ensure the plant’s superior precision of curvature and highest solar reflectivity”. The 160 MW project is owned by ACWA Power and is being developed on a BOOT (build, own, operate and transfer) basis with 3 hours of thermal energy storage. As a pioneer in the field of solar technology with a worldwide network, FLABEG FE produces flat and curved mirrors for all CSP technologies – Parabolic Trough, Dish Stirling, Power Tower and Linear Fresnel Systems, as well as customized mirrors for CPV applications. Thanks to the latest bending and coating technologies, FLABEG FE solar mirrors provide the highest degree of precision and reflectance. The relevant quality parameter for accuracy, the focus deviation (FDx) today is lower than 6 mm – an improvement of more than 1 mm compared to the already outstanding quality set by FLABEG FE mirrors in 2013. In combination with a solar reflectivity of more than 94.5% FLABEG FE again sets the benchmark for the CSP industry. FLABEG FE GmbH, 100% owned by the Saudi-Arabian ACWA Holding (a MENA leader in infrastructural development specializes in the power and water sectors), is the global leading developer and manufacturer of solar mirrors for CSP and CPV. Due to the long-standing experience (more than 130 years) in the use of most modern bending and coating technologies, the company is able to produce solar mirrors with a focus deviation (FDx) lower than 6 mm and an energy reflection of more than 94.5%. The extremely robust mirrors were installed in the first commercially operated power stations in the early 80s. These mirrors are still in daily operation today, without any decline in performance or efficiency. FLABEG FE has been expanding its skills in the area of engineering services and project development support in parabolic trough technology. The company has developed a new collector design – the Ultimate Trough Collector. The design goal, a 20-25% higher cost efficiency compared to currently available technology is proven in a full demo-loop, integrated and operated in a commercially operating solar thermal plant in the US since 2013. FLABEG FE received the SolarPaces Technology Innovation Award for the Ultimate Trough 2013.